• Eco-friendly, asbestos-free brake shoes and bigger drums for instant braking. • Big and bright multi-reflector headlamp for enhanced visibility with a dash of style. • Stylish Speedometer with 'eco-range' and fuel gauge. • Primary Kick & Auto-Decompression System to effortlessly start the engine at any gear. 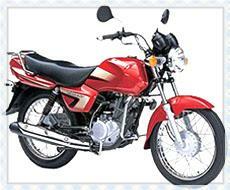 • Robust Aluminium Engine for superb cooling and macho looks. • Advanced Gearbox and Gearshift Pedal for a smoother and convenient ride. • Sporty muffler for enhanced safety and style. • Ergonomically designed seat for easy ground access and minimum knee bending. • Large under seat storage space. • Large and Hardy Rear Carrier for carrying heavy articles.